This is London. 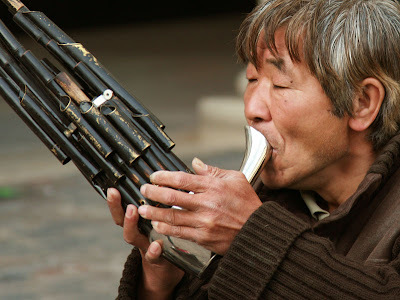 A busker in Covent Garden, playing a traditional Chinese flute. A metropolis at its best! Wonderful photograph, Mo. You have captured his concentration and intensity. I like the tones that make up the image. There is a big Chinese community in Chennai, many of them have never been to China. i spoke to some of them over the years, they don't want to go. We had a Chinese laundry nearby, a shoe maker and of course fast food. One of the wonderful things of our shrinking world is that now we get to see the wonders of that world in our own back yard. Today and yesterday's photos are testaments to that. Aren't we lucky! Oooh, very cool shot. What an incredible instrument...have never seen one before. Wow. And I've never seen or heard this kind of flute. And China's nearer Manila than London! I love London buskers! I hope the music he played was as good as this photo. Excellent photo. I've never seen one of these before. Did it sound tuneful? It's really lovely to be able to come out of the Royal Opera House, into the Piazza, and hear the beautiful sounds from the buskers. For a while there was a North American Indian in full national costume playing wooden pipes, and the music was hauntingly beautiful. And who could forget the wonderful Allotment that was put together in the Piazza last year ? A green oasis right in Covent Garden. Perfect. I wonder if you took a picture ? That's a wonderful looking instrument. I don't think I have seen one or heard one before. Does it sound good? Nice tight framing of the subject. I love this picture, Mo! It's intriguing and visually appealing, and despite the fact that there's no audio, you've really captured the essence of his music.